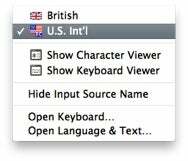 If you ever use any of the alternative keyboard layouts available in OS X (System Preferences -> Language & Text, Input Sources tab), you know that some of their names are quite cumbersome—U.S. International - PC, for example, or Armenian - Western QWERTY. Fortunately, you can edit the names of those input methods so they’re easier to understand and work with. Shorter keyboard layout names can make the Input menu more readable. In the Finder, go to /System/Library/Keyboard Layouts. Control-click on AppleKeyboardLayouts.bundle and select Show Package Contents from the menu. Now go to Contents/Resources within that bundle. Select the folder for your locale—English.lproj if you use English, for example—and press Command-I to open its Get Info dialog. If you don’t already have read/write privileges for that folder, open the padlock at the bottom, provide your administrator’s credentials, click the plus (+) button and add yourself to the permissions list. With your name still selected, select Apply to Enclosed Items from the Action menu (the one with the gear icon). Now navigate into the English.lproj folder and open the file InfoPlist.strings in TextEdit (or the text editor of your choice). Look for the line containing the name of the keyboard layout you want to change—”USInternational-PC” ="U.S. International - PC", for example. Change the name between the quotation marks on the right to whatever you want to appear in the Input menu: “USInternational-PC” ="U.S. Int'l", let’s say. Make sure not to enter a name that’s already in use.